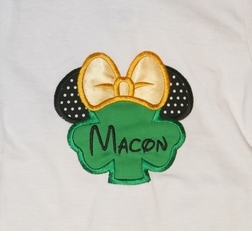 We adore this Disney St. Patrick's Day applique design! 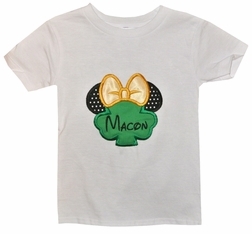 A customer wanted something "St. Paddy's" for her girls on their visit to Disney in March. Well, what colors do we think of for St. Paddy? Green and gold of course. Green for the lucky shamrock and rolling hills of Ireland and gold for the pot of gold at the end of the rainbow that the leprechauns seek. And, black of course for Minnie's ears! 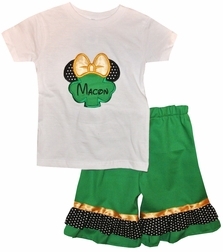 We designed the outfit to use a white cotton shirt appliqued with Minnie in the shape of a shamrock. Minnie's head is in green with black with white dots ears and shiny gold fabric and trim for her bow to resemble gold. We pair the shirt with green shorts or capris with a bottom green ruffle on each leg, a black dotted fabric ruffle above and small gold ribbon above both ruffles again to bring in the gold of the leprechauns.